We are what we eat, What shall we eat? For past generations, each season brought with it a harvest of different fruit and vegetables, these harvests complement the seasons, lighter foods in the spring and summer, heartier, comfort foods in winter. We now expect all of our favourite produce, regardless of the season to be on the shelf. However, convenience comes at a cost—we are increasingly disconnected from our food, how it’s made, or when it’s harvested. This disregard for our growing seasons is a real cause for concern, obesity, rise in ready-meals and general reluctance to cook; I say let’s eat food that is in-season and local—but why? Seasonal food is fresher since it has traveled fewer miles to get on your plate, this reduces greenhouse gas emissions, plus being at the peak of its supply means in-season produce prices are generally lower. Seasonal food is less reliant on chemicals and pesticides. Use of harmful chemicals to secure out-of-season harvests is often standard procedure. Choosing seasonal produce is a more earth-friendly choice. Get creative and try new dishes. Eating seasonal can actually enrich your palate rather than restrict it! Experiment with delicious seasonal flavours and benefit from the taste of fresh foods in new dishes, all good! I know shifting our routine food system is not an easy task but making it a point to eat seasonal produce is a small step to help reshape what the future of food will look like. Let’s bring back bolder flavours and support local farmers, sustainable farming practices and our food economies. Motivation is hard during the winter and to stay physically in shape and to continue to be our best selves takes dedication, lots of patience and lots of motivation. I always found excuses as to why I couldn’t go to the gym – needed to wash my hair, wash the dog, make a cake, the list goes on, I just always found a reason not to go and what did I do with the time I could have been at the gym – NOTHING, yes, literally nothing. I just didn’t like going to the gym. Then I found yoga, I loved it from my first practice to this day. Because I love yoga I practice on a regular basis, I found the benefits of yoga took shape very quickly, I became more flexible, had more energy and simply felt that I looked better and so much stronger. The discipline to stay fit and healthy is so much easier when you love the activity you are doing and can see the benefits almost immediately. I know that whatever my day brings when I step on that mat, my mind quietens and my focus changes. When the temperature drops a Vinyasa Flow comes into it own, it creates a warmth throughout our bodies, it stretches all our muscles and helps us breathe deeply clearing our lungs. Keeping our muscles supple is paramount in health especially as we all get older, suppleness keeps us young and helps us keep moving throughout life. So open that mat, slip into something comfortable, take a deep breath and gently start your flow. Have you noticed at this time of year our skin looks sallow, the tan of summer has long gone and in its place, we have dry, dehydrated skin which is definitely not looking its best, especially if you have been to a few Christmas parties over the past few weeks. Our skin however is the largest organ of the body and contributes hugely to all the detoxifying process with our other internal organs, including our liver, bowel, kidney and lungs. It is so important for us to keep up our winter yoga practice at this time of year as it helps the skin glow and renew, if you do a strong, heated vinyasa yoga flow, it will help the body in a natural way cleanse and hydrate the skin which will increase the texture and suppleness so that you get a natural yoga glow. As the temperature drops outside our circulation starts to decrease which then slows the effectiveness of our organs and lowers our body temperature. This leads to a stiffness of the joints, constriction of the muscles and as I mentioned last week a tendency to want to just curl up on the sofa. With this in mind, last week we looked at Sun Salutations, this week let’s think about keeping our arms up high. When we raise our arms up in any of our poses it will increase your heart rate and your body heat. We can do this at every opportunity Tree Pose, Warrior Three, or perhaps even Warrior Two just moving our arms up to the sky instead of stretching them horizontally. We can think about it with forward bends and seated folds. Make sure as you stretch upwards or forwards you are stretching your spine, working all your muscles to raise that inner temperature. When we do any physical activity it’s simple really, if we love it we will keep doing it and if we hate it we won’t carry on. Yoga I love it, I love the way it makes me feel, it calms me down, it energises me when I need it, it has given me a strong body and flexibility. Anything that gets us moving is good for our health, mood and wellbeing. Yoga is a super food of exercise, it energises, calms, refreshes and makes you feel powerful. You are using your body and mind in synchronisation making it strong, whilst also calming your mind after a stressful day. Don’t let the weather get you down and miss your yoga fix and classes. It is more important than ever with Christmas parties looming to make sure we keep our bodies and minds powerful in the lead up to Christmas. Touching our toes, nearly everyone has done this move, whether we practice yoga or not. It starts when you are a toddler and it is so easy, continues as a child to teenager together with cartwheels, the crab and forward rolls. The forward bending pose a simple pose but a powerful move that is used in most styles of yoga and exercise. When you reach forward and bend it really gets into your lower back, opening up any tightness that you may have there, you are also lengthening all the muscles along your spine, especially useful if you have a sedentary job that requires a lot of sitting. It is great for tired or tight upper back muscles as it makes your head relax and the neck creates a gentle pull which then releases your shoulders and upper back. If we push this pose a little further and twist our bodies we are deepening the stretch and massaging our digestive organs. When we hold this pose a little longer we will start to strengthen the thighs and knees, reduce stress, anxiety, fatigue and calm our minds. As the wonderful summer continues, stay cool this weekend, with meditation and cooling stretches. Try the tree pose, this will cool the mind whilst strengthening the body or perhaps Savasana (corpse pose) a perfect pose when the heat turns up, a beautiful pose to practice as it it the ultimate restorative pose, lifts the spirit, mind and body whilst helping you reduce your body temperature in as little as 5 minutes. Retreats, what a wonderful way to connect with my yogis. By spending quality time together in our practice of yoga you get a wonderful connection, this came home to me especially during my last retreat in the French alpine village of Chatel. So, imagine the setting, I am co-teaching a yin/yang class with my yoga buddy on this retreat ‘alpineyogamummy’, it was a beautiful setting on the sunny terrace of the La Chaumiere Chalet. We are on the terrace with the surrounding mountains as our backdrop, the weather is gorgeous and we are revitalising our minds whilst detoxing our liver and kidneys. When a eureka moment happened, I was using my Tibetan bowl to help us stay in our yin pose longer, which sounded absolutely stunning with the bells from the cows on the mountainside, when suddenly the church bells started to chime in synchronisation which totally completed the sound therapy surrounding us….. a truly, truly magic moment. It was a wonderful long weekend in Chatel, enjoying the mountain air, hiking to Lac d’Arvouin a stunning interior lake surrounded by several summits, we drank rose and bubbles and ate lots of local French food prepared by the wonderful Lisa. Retreats what a way to re-connect with yourself, to find inner peace for a few days and to focus on a mindful way of living, whilst enjoying yoga in peaceful, tranquil locations. I am always looking at new retreats options and locations as I believe that we all need a few days out from our stressful lives. Why do I love yoga, so many reasons, it has helped me with anxiety attacks, it has helped me relax and be calm in the face of adversity, it has given me focus, it has made my body strong, plus more flexible, I could go on and on with the benefits I have achieved through practicing yoga, including the fact I love helping and watching others achieve the same benefits. With humans living longer due to better eating, living conditions and healthy lifestyles, this also means we can get age related illnesses. One of the really important aspects of yoga is it improves our brain’s ability to think quickly, accurately and to process information precisely. The health experts believe this is because in yoga we encourage you to be present and mindful all the time. To think about your practice and what you want out of the day. Apparently, this awareness brings on structural changes in our brains, including growth in the prefrontal cortex. This is associated with working memory and attention. If ever there was a reason to practice your yoga on a regular basis this one benefit is like super food. Over the last few weeks we have looked at being kind to ourselves and how we talk to ourselves. Being strong in both body and mind and finally last week being mindful of what we eat. Throughout this we have touched on our souls, by looking into our souls and feeding our souls. Today I want to think about how yoga impacts our souls, we all have various hardships to weave our way through. It is how we deal with these hardships or problems that make us a better person. Life always throws things in your path to derail you but practising Yoga helps you stay calm and more confident. It improves our moods and as you work through your practice, those wonderful endorphins are released which in turn makes you smile (even when you don’t want to). I could go on about the benefits for hours, but for me however, one of the most important factors of yoga is mindfulness and how you deal with those times when life isn’t perfect. Practising yoga will help with breathing techniques. Practising meditation or slow deep stretches help you remain calm in adversity. Finally, yoga helps with stress, whatever type of yoga you practice whether power yoga or yin it really brings all those stress levels down, leaving you feeling calm, serene and positive. All good for our souls. Still thinking about our bodies, especially now the sun has made an appearance. I got to thinking, how many of us actually look at our bodies in the mirror. Do you? I mean do you really look at yourself? Or do you casually glance at your reflection as you pass by. I recently read an article about looking at yourself in the mirror and seeing your soul. It is a very powerful thing to really look at yourself, it can bring you peace, and it is really therapeutic. Now I am not talking about negative thoughts on your body, when your critical inner voice states, you have love handles, flabby arms, etc., etc., etc. I am talking about looking yourself in the eye and seeing deep within yourself and making peace with yourself, getting naked in front of the mirror and not judging yourself. In yoga, we look for inner peace as we stretch and work through our asanas, but, next time when you are practicing yoga and have a mirror, look at yourself with no filter, no shame and certainly no judgement…… see the good person you are, the strength your body has and your soul. "He's more myself than I am. Whatever our souls are made of, his and mine are the same"
Body image what a huge bag it is these days. We are constantly bombarded with images on a daily basis in the newspapers, magazines, television, instagram, facebook, the list just goes on and on and the message they are giving is ‘don't I look great and skinny’ or ‘look at my muscles and the definition’. There are celebrity DVD’s or downloads to help us lose our muffin tops, we are constantly bombarded with what is good for us, what is bad for us and the inner critic reaches everyone. I believe it is time to take a stand. None of us, yes I know this is radical but none of us are perfect, but life is not about being perfect, it is about being fulfilled and happy, waking up happy, going to bed happy. When you are happy and fulfilled you don’t worry about the little things because you are enjoying the big picture of life. I believe yoga helps us all bring balance to our lives, it helps us think positively, it helps alleviate negative thinking and bring in a healthy balance. By regularly practicing yoga you relax, take time out of your day to be positive, give yourself energy, alleviate stress and makes your body strong. Lets embrace our imperfections and become, strong, healthy and a lot, lot, wiser. 'You are imperfect, permanently and inevitably flawed and you are beautiful"
Spring is around the corner, spring is in the air, I can feel it, breath it and want it. Last week I felt that we had been thrown back into the depths of winter, yet a week on the birds are singing and building their nests, the daffodils are standing tall and the sunshine is back - ok with a few showers thrown in, but it wouldn’t be spring without the rain showers. The mornings are lighter, I feel a spring in my step and my mind is thinking salads. I know it can all change, but I like this uplifting feeling as it spreads into everything we do on a daily basis. I jump out of bed instead of hiding under my pillow. I am loving my early morning stretch and feeling the life in my bones. I also love sitting on my chaise upstairs and looking out onto my garden and countryside watching everything start again……. New beginnings. Every day is a new beginning and it is so important to take a few moments to enjoy the dawn chorus from the birds, watch the sun come up or just quietly contemplate the day. "Be willing to be a beginner every single morning"
Today is my daughters birthday and what a bundle she is, my own little mini yogi. 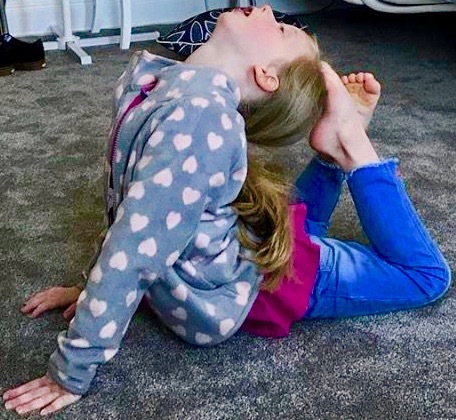 Yoga is so important to children, physically they gain strength and flexibility from practising yoga, plus it also helps them become body aware as they use their muscles in new ways, which in turn improves their confidence and positive self image. It also helps them manage stress with breathing exercises. As for my daughter she just loves doing yoga with her mum, we have lots of fun times together whilst I’m working on poses for my classes, she just can’t help herself, showing me just how flexible she is in comparison to her mum, or if I am holding the plank position just wiggling underneath me…… adds to the pressure, but most of all doing yoga with your young children is just such fun. Is Spring in the air, or is it winter all over again, what a strange mix of weather we are getting at the moment. One minute I’m thinking Spring menu, buddha bowls, salads and all the healthy things that go into a wholesome lunch and the next, Broccoli and Kale soup or hearty stews. This then got me thinking……. a scary thought I know. We are exactly the same with exercise and yoga is no exception. When the sun is shining out come our mats as we embrace the day and our inner yogi. However, when we hear that wind and rain howling we just want to hibernate and hide under our covers. It is so much more important than ever when we are feeling low, or down that we get on our mats and take that first deep breath in, because we all know that at the end of our practice we will feel invigorated, energised and ready to face anything….. including the wind and rain. Wives and woman’s groups sent them abroad to the soldiers because the ingredients kept so well on the long journey. Preheat oven to 160f. Place flour, coconut, sugar & oats in a bowl & mix well. Place butter & golden syrup in a saucepan over medium heat & melt. Place bicarbonate of soda in a small bowl & add water, stir to combine. Add bicarb mix to saucepan & stir. Pour over oat mixture & stir all ingredients together. Roll teaspoons of biscuit mixture into balls & place on a greased & lined baking tray, leaving room for spreading. Flatten each ball gently with a fork. Bake for 15-20 minutes, or until biscuits are golden brown at the edges. Allow to cool slightly on trays before transferring to a wire rack.